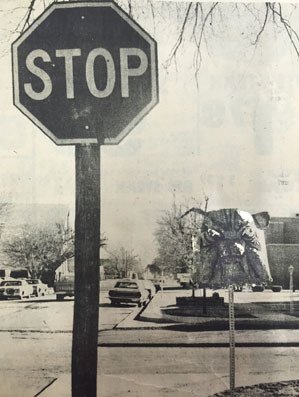 Looking back 40, 30 and 20 years ago, the following are excerpts from the Artesia Daily Press from Jan. 10-16. It’s only January, but Saturday was one of those spring-like days that beckons us all to the outdoors. By Saturday afternoon, a number of Artesians had taken to city parks for a picnic or a few hours of play in the mid-60-degree warmth of the day. Some students in the Artesia Public Schools will soon be eligible to purchase regular 50-cent cafeteria lunches for only 20 cents. The Board of Education voted to implement a reduced-price lunch program following a mandate from Mrs. Gretchen Plagge, state director of school food services. The Artesia Police Department launched an identification campaign to curtail increasing thefts of automobile stereo units and citizen band radios. Because theft of these items is an increasing concern of local police, Sgt. Privetts said police department personnel are making themselves available on Monday afternoons to engrave permanent serial numbers on items brought to the police station. After 39 years of service to the Artesia Fire department, Chief Dallas Golden has elected to retire. Golden, chief of the department for the past 14 years, holds the distinction of being Artesia’s first full-time fireman. He announced his intentions to retire Feb. 29 in a letter to the Artesia City Council. Despite detour signs along the way, State Road 2 to Lake Arthur was opened Monday, including a recently completed bridge. The bridge was replaced with two arch pipes measuring 60 feet wide, eight feet high, and 70 feet long, according to State Highway Department officials. Eddy County received General Revenue Sharing funds this year, according to County Manager Bob Stockwell at the Eddy County Commission meeting earlier in the week. The county received 91 percent of the previous year’s amount of $606,856, or about $556,183. The Artesia Police Department announced its employment number as 23 with two narcotics agents, two detectives, four jailers, four telecommunications officers, nine reserve officers, two clerks, two part-time telecommunications officers/ jailers, two dog catchers, one parking enforcement officer, an administrative assistant, and one custodian. Rigo Chavarria, a 1988 graduate of Artesia High School, graduated from the New Mexico State Police Academy Dec. 1 and is now a state officer. He has been with the Artesia Police Department for 21 years and is a lifelong Artesia resident. Micaela Galvan Brito celebrated her 92nd birthday with family members at the Artesia Center Saturday. She has 11 children, 51 grandchildren, 108 great-grandchildren, and eight great-great-grandchildren.